This paper considers the implications of conceiving contemporary tertiary art education in terms of models of logical-mathematical being and understanding. While art and aesthetics have always borne a relation to the field of systematic abstraction that numbers represent, something new is afoot, and it affects precisely a conception of education. Art education is increasingly conceived in terms of sets of discrete and equivalent competencies and transferable capacities (project development, imagination, communication, teamwork, etc.) that can be clearly mapped to the requirements of the workplace. The value of an art education is becoming cast in terms of its equivalence – its capacity to be applied elsewhere. While these changes are affecting education generally, they have particular implications for the traditional self-understanding of art education as a critical, qualitatively particular and holistic space. Below is a diagram that I encountered in my very first lecture of a degree in Communication and Media at the University of Canberra (then Canberra College of Advanced Education) in 1981. This is US mathematician and electronic engineer Claude Shannon’s very influential diagram of the communication process from his Mathematical Theory of Communication (1948). Shannon is a key figure in the invention of digital computation, having demonstrated how the abstract system of Boolean algebra can be represented in the material interaction of binary electrical circuits. As a humanities oriented student, this diagram made little sense to me. The whole idea of breaking the communication process up into discrete mechanical aspects, of suggesting that it flows in a single direction and of positing a key relationship (and antagonism) between system noise and instrumental signal, seemed a vast oversimplification of properly human processes of social interaction and negotiated meaning. It was only much later that I came to recognise that it was a profoundly novel and creative way of thinking about how an ordinarily qualitatively conceived process can be represented in quantitative terms, but at the time it seemed simply daft, and indeed the course never really properly reflected upon the deeper implications of this model. We quickly passed on to other more apparently sophisticated models that included dimensions of feedback, cultural context and meaning. Then very swiftly we shifted away from diagrams altogether towards the difficult textuality of semiotics, cultural studies and post-modernism, leaving Shannon’s initial diagram as an anomalous and reductive joke. I wonder now, however, who is getting the last laugh, particularly as more and more aspects of qualitative experience are rendered in logical-quantitative terms. This is probably less a factor of logical-mathematical thinking per se than of a specific neoliberal application of logical quantification, but for the purposes of this paper I will risk speaking more generally. I take this risk partly with the sense that the functional perspective that Shannon’s model demonstrates cannot be reduced to the space of contemporary higher education managerialism. It is something that has a longer history and broader implications. It represents a particular ontological and epistemological framework for making sense of the world that has its basis in the mechanisms of logical and mathematical abstraction. The issue obtained clarity for me while attending a whole day seminar on current higher education micro-credentialing initiatives. 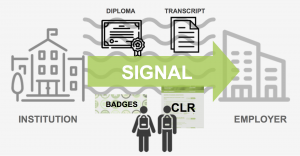 Micro-credentialing involves conceiving whole qualification programs as discrete portions of attainment that are mapped to national and international curriculum frameworks and standards. So rather than receiving a single overall testamur for a three or four year degree, students undertake any number of micro-credentialed courses from one or more providers that individually demonstrate specific transferable aspects of experience, skill and understanding. These can be subsequently combined to represent an overall level of qualification attainment. I have no objections to this per se. It would seem to provide an effective way of addressing the complex educational needs of contemporary learners, who very often lack either the financial means or the time to commit to longer and sustained degree studies. Just as we currently divide up our curriculum into discrete subjects, why not decompose whole degrees into a set of modular units? After all, this is becoming the norm in all kinds of informal online educational contexts. Yet linked to this, particularly within tertiary education, is a call for standards that can render one micro-credentialed qualification comparable to another. This involves combining a conception of small and discrete educational components with one that envisages effective means to map these components in terms of features of equivalence and transferability. It is this structural association of the discrete and discontinuous with the equivalent and transferable that represents a more thorough form of logical-systemic representation. The overall purpose of micro-credentialing is to foster a more direct and transparent relationship between tertiary qualifications and employer needs. Students no longer receive an opaque overall qualification with a large number of individual results for particular subjects. Instead, they receive a set of micro-credentials that explicitly indicate particular areas of employer relevant expertise. 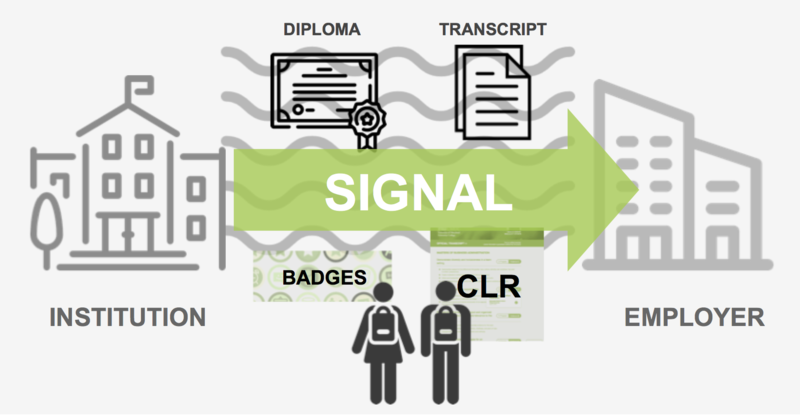 Micro-credentials represent the attainment of key learning outcomes. They are less discipline and curriculum focused than outwardly oriented towards areas of general competence and capacity. In this sense, they reflect a broad effort to establish a better alignment between tertiary education and the employment market. I should note that, beyond these straightforward aims, micro-credentialing is linked to efforts to coordinate aspects of the qualification and employment market via block-chain technologies. It is regarded as one component in establishing a universally recognized ledger of individuated labour capacity. This depends upon establishing associated layers of abstract data representation that I lack the scope to adequately consider here, but that are clearly aligned with an overall logical-mathematical systems logic and that are very evidently worth examination in terms of their implications for traditional mechanisms of qualitative evaluation of job applicants and the like. In an effort to explain the particular value of micro-credentialing, Jon Mott, Chief Learning Officer for Learning Objects (a major US based micro-credentialing provider) gave a keynote lecture for the seminar that drew upon Shannon’s technically focused model of the communication process. While he never mentioned Shannon directly, there is the same sense of a signal passing from one place to another within an ever-present context of potential signal disruption (noise). In this case the signal is cast as education, and more specifically the educational capacities of graduates, which must pass through the noisy vagaries of current diplomas and transcripts to be imperfectly decoded by employers. Micro-credentialing, in Mott’s view, provides a means of reducing this noise and making levels of attainment more legible for employers. I felt a spark of recognition when I saw this slide. It not only demonstrated how tertiary education is increasingly perceived in very directly functional terms – in terms of instrumental system integration – but also the wider sense of how education is now regarded in fundamentally logical-mathematical terms. What do I mean by this precisely? According to Leibniz, logic begins with the thinking of identity: X = X. Something exists as itself. In the midst of this, the thing also obtains the strange potential to be doubled, to be thought not just as one thing but as two things on either side of an equation that are identical. Other philosophers conceive the matter differently. Hegel, for instance, insists that identity is not a pre-existing state, but only emerges through difference – the same encounters its other in order to dialectically establish for its own distinct identity. So the formula becomes something more along the lines of, X = (X ≠NOT X). The logic of identity has its basis in the determination of discrete entities – and more particularly the identification of the discrete as a fundamental property of things. It also suggests that these discrete things, which may have originally been simply variable and multiple, can now be drawn into delineated relationships of equality and difference that are embodied not only in unique characteristics, but also in shared amenability to abstraction, a shared capacity to be represented as quantities. Mathematics draws upon this logical foundation. Abstracting from the rich diversity of things, it finds means to represent aspects of the world in terms of relationships between discrete quantities. So, in this case, the blurry complexity of actual real world educational experience and attainment, which is currently embodied in the opaque features of the traditional testamur, obtains clearly identifiable shape in a set of discretely characterised micro-credentials. This is one aspect of logically and mathematically inspired conception of education. The other represents an extension of this orientation to the discrete. It involves searching for mechanisms to make elements of discrete attainment equivalent. So holistic aspects of study become discrete entities that are then mapped to qualification frameworks and standards to ensure that they are properly quantifiable and equivalent. Of course this work of conceiving the equivalent dimensions of educational experience has a much longer history than micro-credentialing. It is embedded, for instance, in the principles of the Australian Qualifications Framework, but micro-credentialing lends this notion of educational equivalence much greater and more rigorously defined force. If education is increasingly conceived in systemic mathematical terms, in terms particularly of the discrete, the equivalent and the logically articulable, then what are the implications for notions of art education? In my view there are significant tensions that require acknowledgement and consideration. Since the Dawkins reforms, Australian art schools no longer subsist at the margins of tertiary education initiatives and agendas. They are integrated within this larger and rapidly developing space. Arguably, this is less because of any sense of natural fit than because of a pressing need to adhere to the requirements of the enframing system. Shift from atelier style training to university lecture and seminar style delivery. Incorporation of dedicated strands of humanities style history and theory alongside studio theory. This represents, at least partly, a greater emphasis on the development of generic tertiary level critical and conceptual skills and a reduced emphasis on more traditional art based technical and creative skills. Integration of creative art practice within university based research paradigms via the notion of non-traditional research outputs. This involves positioning art practice as research that produces new knowledge. Increasingly confused sense of purpose – shifting from either a consolatory or resistant activist conception of the value of an art school education to one that is framed in terms of an alignment with wider dimensions of neoliberal being – creativity, entrepreneurial capacity, initiative, collaboration, communication, problem solving, etc. In this latter conception, art education appears to model and develop the agile skills needed to survive and thrive in the modern economic world. I should stress that art education was never specifically considered at the micro-credentialing event, yet there are some obvious implications. The potential restructuring of art education into discrete modules of transferable attainment, and the mapping of these modules to wider qualification frameworks in order to facilitate dimensions of cross-institutional equivalence, may seem relatively minor and incremental developments, but we are reaching a point in which art education – and perhaps the thinking of art more broadly – is fundamentally altered. This change hinges on how art education is conceived. It involves the consequences of thinking of art education as something that it not just susceptible to quantification and algorithmic calculation, but as something that is fundamentally cast in these terms. Stated in strong terms, art education risks becoming reified into a state of being in which all relation to the particular is lost, in which it is little more than a cypher for everything that it may traditionally have placed in suspension or resisted. No doubt this sounds naïve, indicative of an anachronistic sense of art education’s critical possibility, so let me attempt to explain in different terms. In the remainder of this essay I want to briefly describe three areas of apparent tension. I consider firstly the relationship of art and aesthetics to what Shannon describes as ‘noise’. My interest is in the ontology of art – its particular way of conceiving its being in the world, which involves precisely an openness and attentiveness to the sphere of noise. Secondly, I consider the issue of multiplicity – how art relates to dimensions of multiplicity and number. This is about the epistemology of art – how art conceives multiplicity without ever completely passing into reified logical mathematical abstraction. Thirdly, I consider art’s capacity to serve as a social model and agent. This addresses the ethical status of art – particularly how art conceives its social identity as a form of mediation. Once again, I am taking the risk here of speaking very generally. I acknowledge that there is no single notion of the nature of art, aesthetics and art education, but there are key features in the Western aesthetic tradition that rub up against how art and art education is currently being positioned. My aim is try to clarify key aspects of this friction. While the notion of signal to noise ratio is a modern invention, linked to characteristics of electronic communication, the underlying interest in considering the relationship between a multitude of impressions and the distinct identity of rationally articulated phenomena has a much longer history. It can be found, for instance, as the very basis of Western aesthetic philosophy. In his founding work Aesthetica (1750), the German philosopher, Alexandre Baumgarten, posits the field of aesthetics as a means of acknowledging the realm of sensible experience, which affects us intimately and yet which resists neat logical delineation. Drawing upon Leibniz, who envisages a continuity between the mingled clarity and opacity of sense and the abstraction of logically articulated being, Baumgarten is keen to embrace sensible experience, to value its richness and to find means to trace the features of its hidden, intuitive logic in terms that are properly philosophical. The noisy space of the lived is portrayed as a precondition and presentiment for the emergence of logical differentiation and analysis, but also as space with its own elusive characteristics. It appears ambivalently as both the ground for philosophical thought and as another way of thinking altogether. In my view aesthetics, art and art education are fundamentally shaped by this orientation – this effort to engage with the rich uncertainly of the sensible manifold, and within this, the complexity, clarity and obscurity of the particular. To try to dispel the noise, to render only the clarity of signal, is precisely what art characteristically avoids. Instead it plays on the relation between clarity and opacity, between motions of clear delineation and intractable specificity. Within this context of performing a role of maintaining, renewing and transforming the relationship to lived experience, art can never form an adequately predictable communication mechanism. Because it interrogates the conditions of communication – its grounds and modalities – it can never comfortably side with the signal. This is another way of thinking the conventional Kantian notion of the non-instrumental nature of art and aesthetics. It is not that art lacks social value, it is rather that its value lies in disrupting the instrumental relationship as an automatic circuit of abstracted interaction. In these terms, conceiving art education as a straightforward cypher for flexible and creative engagement in the new economy seems misguided. Art education does not provide this form of equivalence. It is implicitly critical of the whole idea of rendering things equivalent, of imagining that one thing neatly maps to another. This is not to say that the skills and capacities of an art school graduate lack substance (or wider applicability), but to insist that this substance has a rich and noisy particularity that extends beyond, and ultimately questions, any efforts to chart dimensions of transferable equivalence. Of course equivalence is not only about charting the instrumental transferability of an art school education to wider employment contexts, it is also about envisaging an equivalence between the variety of offerings at different institutions. This depends upon adherence to common qualification standards, which must now arguably inform the character of all specific courses. In this manner, once again, emphasis shifts from the holistically cast particularity of specific institutional curricula, cultures and experiences towards generic and abstractly determined curriculum features. No doubt some kind of balance of imperatives is possible here, but there is a clear risk of a diminution of diversity, with consistency and equivalence gaining priority over varied and idiosyncratically differentiated identity. The first volume of Elizabeth Holt’s A Documentary History of Art begins with selection from the Benedictine monk Theophilus’ medieval treatise on artistic practice, Schedula. Theophilus explains in his preface that ‘[a]ll arts are taught by degrees.’ Leaving aside the unlikely possibility that he is referring to university degrees, this suggests that learning to become an artist involves a set of clearly determinate steps. At one level this may appear to undermine my argument that there is a necessary tension between traditional art education and the mathematical-systemic conceptions evident, for instance, in micro-credentialing. I certainly do not wish to insist upon an essential antagonism between mathematical and logically sequenced procedural thinking and art practice. While they may be in tension – and for all sorts of good reasons often are – there are many points of commonality, intersection and exchange. Both art and mathematics incorporate aspects of abstraction. Both also incorporate aspects of systemic procedure (most obviously evident within contemporary art in the tradition of Conceptualism). They can also both be poetically inspired and oriented towards aesthetic beauty. Nonetheless, logic and mathematics operate more consistently at the level of the general. Although art may regularly attempt a similarly symbolic rigour, it can never quite achieve adequate distance from the noisy texture of the real. A later section from Schedula suggests this difference between a logical-mathematical and artistic-aesthetic conception. It describes how to apply gold leaf to parchment. Of Gold Leaf. Take Greek parchment [that is paper], which is made from linen cloth, and you will rub it on both sides with a red colour which is burned from sinoper, that is ochre, very finely ground and dry, and polish it with a beaver’s tooth, or that of a bear or a wild boar, very carefully, until it becomes shining, and that the colour may adhere through friction. The emphasis here is upon the interaction between a set of materials with particular qualities. What stands out is the diversity of materials and the sense of nuanced intimate engagement; the rubbing, fine grinding and polishing of the gold leaf on the parchment. The process is described step by step, but this is indicative of a human, temporal relation to the materials rather than of a discretely determined, mathematical conception. Overall, there is a narrative of drawing elements of multiple organically and sensibly articulated elements together rather than of elaborating them in specifically abstract and systemic terms. This is signals a difference between the notion of multiplicity and number. Multiplicity suggests an irresolvable sensible plenitude and diversity, whereas number suggests linear order and dimensions of equivalence. None of this necessarily implies that micro-credentialing cannot accomplish something similar, that it cannot be directed to the development of organically related and particular skills. The sense of potential tension is more contextual and political. The issue is that the fragmentation of education that micro-credentialing entails takes place within a context in which the traditional holistic experiential conception of art education is already affected by the disruption of subjects, lectures, tutorials – by all the various discrete and systemic ways in which university educational experience is divided up and organized. Within this context, micro-credentialing appears as a force that potentially exacerbates this trend. Everything holistic that the atelier model represented risks being further eroded by yet another motion of logical subdivision. This need not be the case, but only by reflecting upon how subdivision can be effectively linked to dimensions of holistic experience – only by reflecting upon an obvious area of tension – can we find the means to sensibly incorporate or reject whatever it is that something like micro-credentialing involves. Perhaps it will even permit some thinking beyond the conventional sense of difference between number and multiplicity, but all of this depends upon some critical work. Despite, or perhaps precisely because of its focus on the particular, art and aesthetics have regularly been positioned in terms of their capacity to model other things. For Kant, aesthetics serves as a means of indicating an open and intuitive alignment between the apriori features of rational understanding and the endlessly elusive realm of the thing-in-itself (the world as it exists beyond human sense-making). The aesthetic experience of the beauty of a flower, for instance, which is often expressed in terms of its symmetry, etc. is pleasurable precisely because it suggests that the apriori sphere of mathematically logical form can have an existence that exceeds the mind itself, that can appear literally and sensibly before us, but without any need to be decomposed into logical, symbolic terms. Aesthetics serves then as an intimation of an ultimately never verifiable whole in which world and mind align. Beyond this dimension of epistemological reconciliation, aesthetics also regularly serves as an ethical and political model. In response to the French Revolution, the German writer and philosopher Freidrich Schiller wrote a series of letters entitled On the Aesthetic Education of Man (1794). Appalled by how the high-minded political values of liberty, fraternity and equality had degenerated into the violence of the Reign of Terror (1993-4), Schiller argued that any political education of citizens needed to be preceded by something more basic – an education into the realm of feeling and sensibility that would provide the true basis for any genuine lived community. Aesthetics was positioned then as a vital educative force that prepared an essential ground for ethical action. More recently the French philosopher Jacques Rancierre positions art and aesthetics not simply as a model for enlightened social interaction, but more forcefully as an intrinsically political phenomenon. Art and aesthetics inform a particular ‘distribution of the sensible’ – a particular conformation of the nature, affordances and possibilities of lived experience, with the capacity to both articulate and, in genuine political moments, transform existing social and material relations. Yet even here there is a sense that art and aesthetics are positioned as exemplary, as a dimension of culture and lived experience that attains broader currency and significance when something telling happens. In very typical terms, this at once attaches too much weight to art and aesthetics (expecting them to transform sensible experience generally) while also neglecting what art can be if it is not simply political. It is always difficult then to regard art and aesthetics in their own terms. They are always signaling something else, always serving as a sign of phenomenological reconciliation or of political ethical being, and always acting as a mediator for other things. This awkward sense of identity is also, of course, linked to the marginalisation of art and aesthetics, which appear at once as hugely significant and utterly insignificant. In this sense – in terms of their complex positioning, inflated egos and lingering sense of irrelevance – art and aesthetics do obtain a distinct self-identity, but one which is characterised precisely by questions of being, status and social purpose. Beyond this there is the realisation that art and aesthetics, which have always served as models, are now themselves subject to modeling. Shannon’s model provides an example, especially in terms of its underlying faith in the potential to reconceive qualitative processes in quantitative terms – to represent the continuous as discrete, the open as finite and the multiple as numbered. Art and aesthetics may resist this conception, but hardly adequately or convincingly. The contemporary dilemmas of tertiary art education provide an example. It often appears as losing a sense of effective agency – regularly compelled to compromise in order to secure any strands of continuing existence. If now it divides itself up into discrete micro-credential modules, or if it conceives national and international art education qualification standards, or if it presents itself in the most glowingly employable terms, this is less to articulate its own space of modeling than to be modeled by wider tertiary education agendas and initiatives. How can we conceive our scope for agency? How can we link whatever becomes of art education to the tradition of whatever it once was and once imagined itself to be? This account may seem alarmist. Arguably, none of this really affects art education, which just goes on in roughly the same form as it always has, occasionally better supported, more often worse. All the rhetoric of transferable skills, all the talk of creative industries, all the sense of art education as a cypher for agile existence within the entrepreneurial, portfolio and gig economy, is precisely that, rhetoric; it does not really get to the heart of what we do. We compromise to survive, but without really compromising – or that is the story that we tell ourselves. The key thing that we risk losing in all of this is the capacity to recognise what is happening – to speak clearly of the implications of new models. This need not involve a nostalgic return to the qualitative. It need not demand an unviable insistence on studio-based holistically experiential art education. It need not even require an avoidance of standards of course equivalence or the pursuit of instrumental, socially and economically geared models of art. What is needed, however, if nothing else, is a historically informed reflection on implications – some kind of value focused understanding of what an art education represents and can do. My fear when I attended the recent micro-credentialing event was of changes that are occurring by stealth, in terms an unreflective logic of system optimisation that undermines all potential for criticism – that positions criticism as something impertinent, or at best as something that can happen later or elsewhere. It is this above all that needs to be questioned. I am not opposed to logically and mathematically inspired models of contemporary education. I can even recognise their provocative value, but we must find the means to respond lucidly and effectively to this provocation if anything worthwhile is to emerge. I’d rather not conclude, however, with the standard admonition that ‘critical reflection is required.’ It seems to me that something more positive is needed. There is little use in just lamenting the loss of a particular idealised notion of art education, or of lamenting that that this loss is scarcely recognised or reflected upon, we need pursue options that provide us with greater proactive agency. Explore and embrace new online modular and distributed educational forms. Question the need for the traditional studio experience, with its face-to-face teaching and actual student cohorts. Explicitly engage with this space of apparent loss. Or look for ways that micro-credentialed modularity can establish new experiential contexts and communities that extend the nature and scope of conventional art education and art practice generally. Devise associated qualification standards that explicitly acknowledge and provide scope for a diversity of pedagogical approaches and institutional cultures. Celebrate the potential for abstract description. Allow the standards to be entirely general and to have only minimal implications for specific aspects of curriculum, teaching delivery and learning experience. Pursue ways of conceiving art education in directly useful (equivalent, transferable and adaptable) terms. Insist that artists belong in banks, in the public service, running businesses, etc., but couch this usefulness in terms of engaging with and drawing value from dimensions of noise. Position art practice as a means of creatively thinking through the interaction between signal, medium and context – less to eliminate noise than to acknowledge its necessity and more open, critical-productive potential.